♦ Pioneer Magnetics’ True Hot Plug Power System eliminates down time by providing glitch-free, continuous operation for critical systems that must not fail. 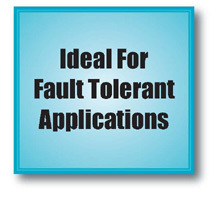 A standard line of high reliability switching power supplies is combined with an industry standard 19" or 23" rack to create an advanced hot plug system. ♦ True Hot Plug eliminates all switches and breakers. The system never shuts down. Less than 10 seconds is required to remove and replace a supply. Power supplies can be swapped at full system power by simply pulling any unit out of the rack and plugging in a replacement. ♦ With a common 5" x 5" cross-section, Pioneer power supplies are available from 1kW Watts to 8.1kW. Standard output voltages are 12VDC to 60VDC. 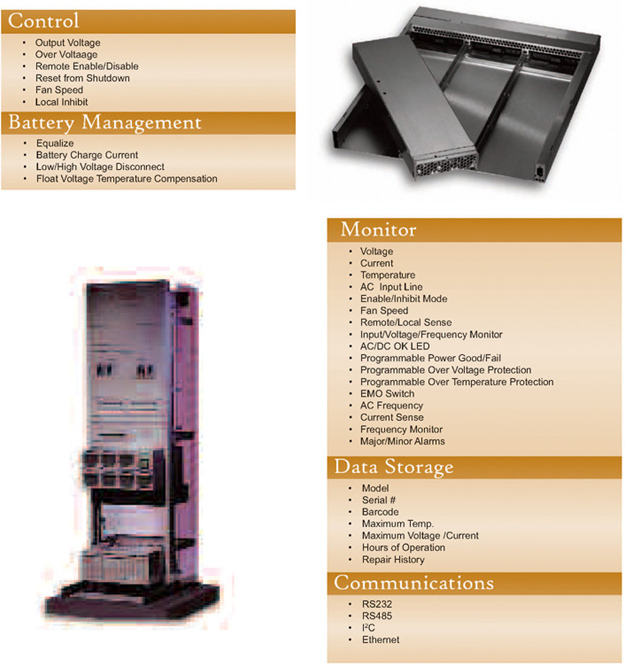 All supplies offer Power Factor Correction to 99.9% in Single Phase AC input or 95% in Three Phase AC input. Built-in single wire paralleling gives excellent load division among supplies, regardless of the number of active supplies. Load is automatically distributed as supplies are removed or added. Wireless (Droop) current sharing provides greater reliability. 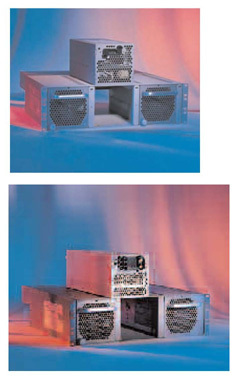 ♦ The PM1450 rack series offers unusual flexibility and capacity, while providing a complete power system solution. Up to three 5" x 5" supplies are housed in a 19" rack, and up to four supplies in the 23" rack. 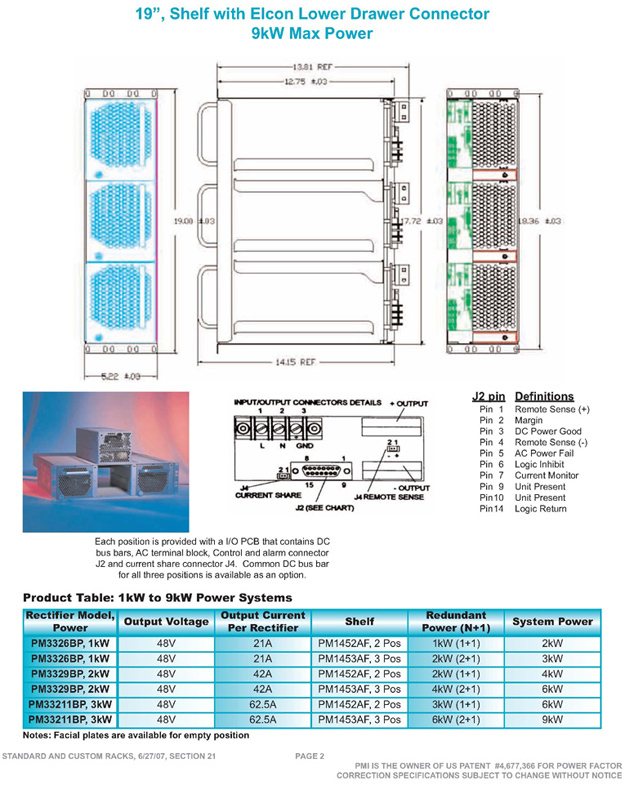 This means that four 8100-watt supplies can provide 32.4kW of power in a single 23" rack. Stacking up five shelves can supply 162kW Watts of redundant power in just 31.5" of rack height. Custom system expansion and future upgrade capacity are readily available. ♦ The guarantee of practically unlimited freedom from shut down. A single Pioneer power supply has a DMTBF of about½ million hours. Redundancy gives a System DMTBF of over 100 million hours or 10,000 years. ♦ A Redundant System (Each supply can carry the full load, or share the load with a second or third supply). ♦ No Switches or Circuit Breakers on the Input or Output side. ♦ No deviation or loss of Output Bus Voltage during insertion or removal of units. ♦ A special customized design combination of Pioneer Magnetics’ Hot Plug Power Supply and Elcon Top or Lower Drawer Connector. ♦ High Power Density to 21watts/in3. CONNECTOR: ELCON DOUBLE DRAWER, P/N 295-33-01100. We certainly have come a long way!! PMI recognizes the need for power supplies to be monitored and controlled either as standalone units or in a large system. This requirement has led PMI to the future once again. Pioneer offers the ability to remotely control and monitor all power supply functions and to record power supply data for critical tracking purposes. A variety of options and configurations are available.